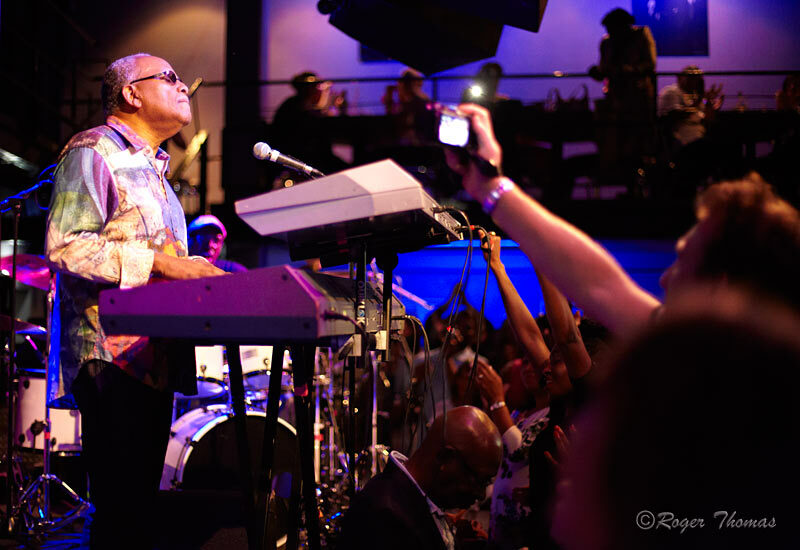 Several decades have passed since Lonnie Liston Smith first graced the scene with music that would establish him as an ardent trail-blazer. His show at the Jazz Café Camden showed that he remains inspirational, despite the passage of time. Like Miles Davis and Art Blakey, he constantly drafts in fresh and young talent into his line-up, the New Cosmic Echoes. Samir Moulay on guitar provided the funk à la Wah Wah Watson and the more refined Benson-esque elements. Tabitha Pearson - vocals, Vernon Prout - electric bass delivered a firm foundation and Lee Pearson on drums provided a solid driving pulse. Smith delivered a representative selection of his legendary oeuvre. There were many moments when this maestro of fusion would let a musician feature while he laid back to provide some of his hallmark textures of pads and grooves where he seems entranced and as if his whole body is playing the music. 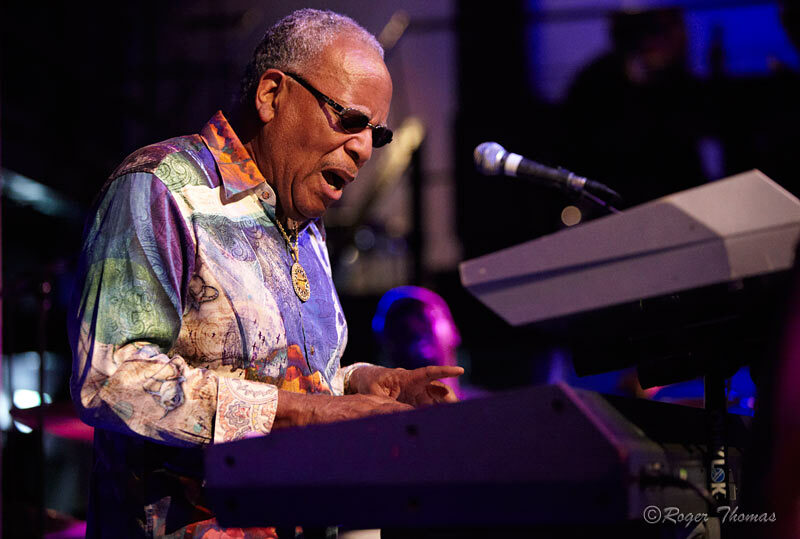 With at least one hand fused to the keyboards, outstretched and leaning back in his signature pose working the keys as if kneading dough, but unfortunately the acoustic of the Jazz Café hid a lot of the subtleties. That said, the star quality drumming of Lee Pearson had no problem breaking through. A five minute solo spot saw such pyrotechnics as playing with hands and sticks coming from behind his back, and even the stair handrails became drums. 'London Interlude' — first recorded in the 1980's — was given a fresh lick of paint with Prout and Pearson shifting moods from a funky Sly & Robbie style groove to straight ahead jazz swing. With Smith interjecting synth rhodes stabs plus melody topped off by Moulay's tasteful jazz guitar solo showed this to be a reinvention that really delivered. Other favourites such as the much sampled 'A Garden Of Peace' and of course ‘Expansions’ were rapturously received. This poignant moment stood as a reminder of how Lonnie Liston Smith has not just uplifted and entertained but also educated and enlightened. The man is worthy of all the venerable accolades heaped on him. A thoroughly enjoyable evening. I saw the band last night in Bristol and, although more a follower of the avant-garde, willingly responded to the cool funk and laid back grooves.Lonnie's playing from delicate motifs to Mothership rumbles was super.Vocalist Tabitha Pearson gave off Minnie Ripperton vibrations in her more ecstatic moments as well as June Tyson(of Sun Ra fame) like declamations.In fact the lyrics about space harmony,peace and riding the Galaxy were reminiscent of Ra's concerns.And what about the crisp drumming of Lee Pearson from slick beats to delicate patterns on the rims and his sizzling hi-hat work.Samir Moulay on guitar was inticate and groovy never overbearing whilst bass player Vernon Prout held it all together and thats some thumb he's got. The delivery was a little 80s orientated especially due to his choice of keyboards. The REAL sound of Fender Rhodes which he used to carve his sound with was sadly absent. The modern convenience of sampled and electronic keyboards can sometimes rob young generations of the excitement of the vintage keyboard experience which is as vital as a real electric guitar or bass. Electric pianos and organs rule.